In unrelated news, a new Dairy Queen opened near her home. Details of the other places we visited, including Denver Botanic Gardens, a xeriscape demonstration garden in Pueblo, and North Cheyenne Cañon Park to follow some time after I catch up on the two 22-hour drives, with commenting resuming sooner! Yea! Glad you returned home safely, Monica. I'm sure many good posts will follow (sorry about the weather)! Welcome back! How wonderful to renew the vows for your niece and her husband. Wow, what a dramatic background for a renewal ceremony. Dear Monica, I enjoy that you back and hope, you have had a very good time in the last 2 weeks. Das ist sicher ein sehr guter Grund, an der Zeremonie teilzunehmen bei Deiner Nichte. Nun werden sich die Pelznasen freuen, dass Du wieder da bist und jede Menge Krauleinheiten einfordern. Hi Monica, what a lovely spot they picked. Looking forward to hearing about the trip, especially the xeriscaping. What a fantastic place to renew your vows .....maybe I ought to get me and Himself to do the same out on the crags in Derbyshire! (we'll have been married 23 years in September). How nice of you to travel so far for your niece, and I think it's great they had such a beautiful setting for a renewal of their vows, especially since they didn't get to have a big ceremony the first time around. 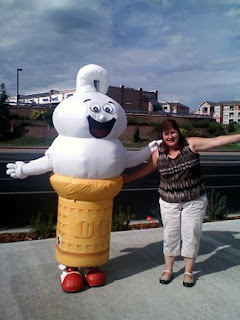 My favorite, though, is the photo of you with the ice cream cone! :) Looking forward to all your pictures from the places you visited. But first, get some rest! Thought you were quiet :) Glad to hear that you have been enjoying a break and look forward to hearing more about your adventures soon. What a spectacular setting for your niece and her husband to renew their vows. What a beautiful photograph - wonderfully romantic place to renew vows! Wow, I can tell by the photo that you saw some gorgeous landscape. Can't wait to hear all about it. Welcome home. I had been wondering about you. :) Can't wait to see all the photos and here about your adventures. Love the ice cream photo! Welcome back! We've missed your posts! What fun! Can't wait to hear all about your side trips while you were gone! You had to have seen some fabulous things, so please share! Congrats to your niece and her husband, too! That first photo is really cool, I mean besides it being such a special occasion and all, I like the way the mountains look reflected in the sky by the clouds. Welcome back Monica! I'm sure Fiona and James were happy to see you. 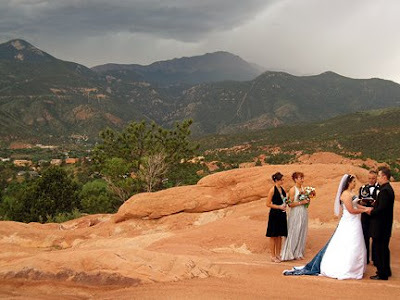 What a gorgeous setting for for renewing marriage vows. Best wishes to your niece and her husband.